The durability of boxing gloves depends upon the used material, upholstery, and workmanship, among other things. It is only boxing gloves achieving good evaluations in all three parts, which provide permanent pleasure to exercise with. The fitting of boxing gloves is determined by fashion, bending of the fingers, and the (hook and loop) fastener. Boxing gloves, which are tight and of ergonomic shape, provide a safe stability, reduce fatigue in the hand, and minimize the risk of injuries. The material plays an important role for choosing boxing gloves. Outside material and upholstery regulate the speed of bounce respectively the hardness of the punch. High-quality, hard-wearing boxing gloves achieve best punch and absoprtion features even for intensive use. If boxing gloves are good or not, mainly depends upon the quality of workmanship. boxing gloves of high-quality workmanship have neatly processed seams making the boxing gloves more sturdy and more durable. In addition, boxing gloves of a higher quality achieve an optimal weight distribution, increasing the wearing comfort and providing an optimized punch precision. 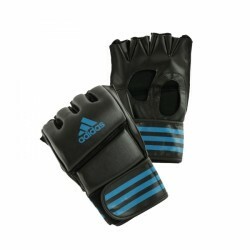 The adidas training gloves Grappling are perfect for mixed martial arts training. The grip gloves are made of PU material with an EVA foam padding for good punch absorption. The open finger and thumb zone of the adidas training gloves Grappling provide an optimal mobility of the hands. adidas training gloves Grappling add to comparison list.